Where a company is in its life cycle can affect the owner's attitude about both business continuation and business succession planning. Recent research from the Principal Financial Group unveils insights into business owners’ priorities and practices. In particular, the study shows us that where a business is in its life cycle can affect an owner’s attitude. Understanding these insights can help you better address business owners’ financial needs and planning concerns. 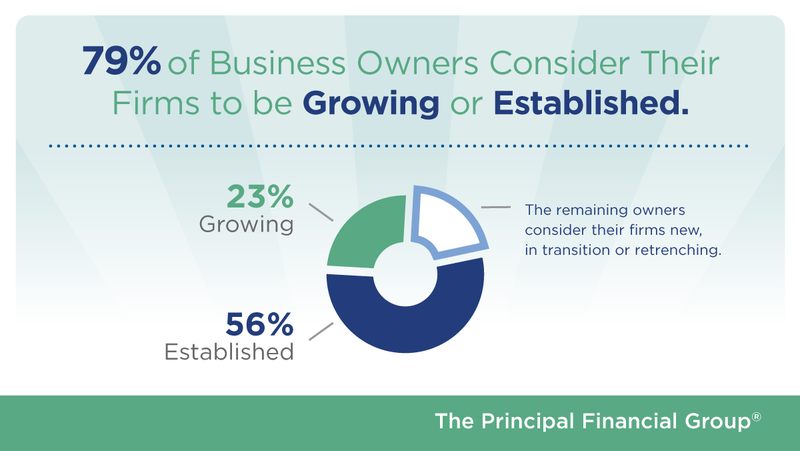 We found that, of the over 500 owners surveyed, more than half consider their businesses to be “established,” while nearly an additional quarter indicated they are “growing.” The remaining owners said their firms are new, in transition or retrenching. Understanding the characteristics that factor into the life cycle of a business can help guide your sales conversation. As you might expect, some of the life cycle determination is due to tenure of the business. Most established businesses (83 percent) have been in business over 10 years compared to growing businesses (56 percent) that have typically been in existence for less than 10 years. Another characteristic, in this research, appeared to be employee population size. We found that the established businesses were largely made up of sole proprietorships with less than 10 employees. Growing businesses, on the other hand, tended to have more employees; in fact, 43 percent indicated they have 50 or more employees. In our research, a large portion of sole owners of the established businesses were over the age of 60. In these situations, transition planning is critical, as the succession options may not be obvious nor quickly attainable. Yet, almost six in 10 of these owners do not have written business continuation plans in place. This is an opportunity for you to help guide them through the planning process and show them how to effectively structure these plans. Without this guidance, business owners will likely run into challenges when they’re ready to transition out of the business — especially if an unexpected disability or death occurs. Growing businesses, on the other hand, tended to have more well-rounded financial plans that include written business continuation plans. They were more likely to have recently had their business valued. These owners are also more likely to work with a financial professional, and to purchase personal income protection solutions. They are nearly twice as likely to purchase business protection insurance solutions than are business owners of established businesses. Ironically, when it comes to workforce concerns, established and growing businesses share similar worries: benefits, retaining and attracting talented employees, availability of qualified job applicants and productivity of staff are all top of mind. You can help them address these concerns with comprehensive employee benefits planning. When working with owners of growing businesses, focusing on how benefits can increase workforce retention and productivity is a particularly strong message. While every business has unique needs, common themes that emerged from this study can guide your conversations. Investing the time to better understand how the business life cycle can impact business owners’ financial needs — both business and personal — can help you grow your business.